Back in the 1970s, the English Department of Missouri S&T (then UMR), began offering a writing minor. One of the first students to take a minor was Terry Bollinger, then a B.S. Student in Computer Science. Terry received his B.S. in 1977 and an M.S. in Computer Science in 1980,both from S&T. The title of this post comes from Terry’s statement quoted above. 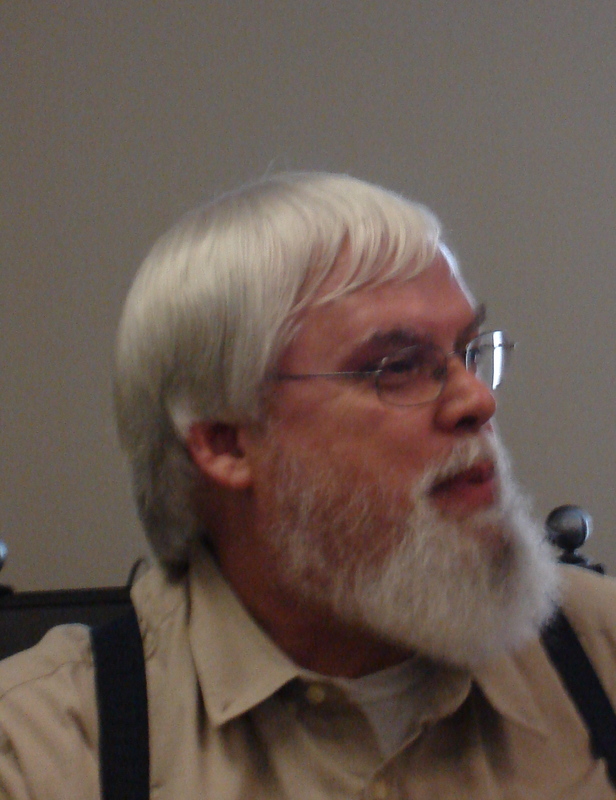 Terry was on the S&T campus on April 23 and 24 as a member of the Computer Science Department’s Advisory Board. The Department of English and Technical Communication was fortunate to have Terry meet with an English/Tech Com 260 class. Terry carried on a lively informal conversation with the class, centering on a project the class has been working on. Currently, Terry works for DeVenCI as their main technology assessor of emerging IT and hard science products. DeVenCI works together with the Department of Defense. Writing is a major component of Terry’s career. If you visit Terry’s personal Web site, you can find many examples of his reports and his advocacy of open source software and of Linux. It was a real pleasure for me to talk with Terry and sit in on his conversation with the class. He was one of my students here and one of the best I’ve had in 42 years. On October 17, Dr. Stacy Tintocalis gave a presentation on creative nonfiction to a group of students, townspeople, and faculty. 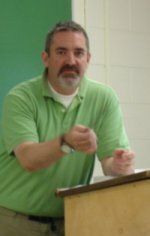 Next semester (spring 2009), Dr. Tintocalis will teach an evening workshop in writing creative nonfiction. Her course will meet on Tuesday evenings from 6:00-9:00. Dr. Tintocalis has an MFA from the University of Iowa and a PhD from the University of Missouri – Columbia. She has published both fiction and creative nonfiction. So what is creative nonfiction? Here, in brief, is a definition based on my understanding of her talk yesterday. Creative nonfiction begins with the writer’s experiences, but as opposed to a memoir, a diary, or a journal, seeks to find universal themes in the experience. In exploring a topic, the writer of creative nonfiction will do research of various kinds, from traditional library research to Web searches to talking with people. 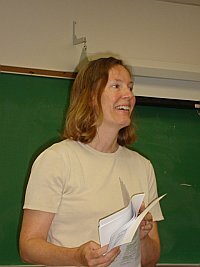 Creative nonfiction uses techniques such as dramatization and several points of view, but is neither fiction nor journalism. If you are interested in enrolling in the course or simply want information about it, you may begin by contacting the department or me. Any reader of literature, especially poetry, soon becomes aware of the importance of the seasons of the year in expressions of human experience. The seasons may be the four of the moderate zones or the two or three seasons of tropic zones. For instance, in Indian poetry, the rainy (monsoon) season is the time of love affairs since the heavy rains rule out most other activities. A contemporary poem expresses the traditional theme well. So, has autumn begun? That depends on where you live and whose definitions of the seasons you use. In Japan’s tradition, it is indeed autumn now. The "season word" (kigo) is an important part of the traditional haiku. An article on Wikipedia discusses various scientific and cultural aspects of the seasons across the world. Of especial interest to lovers of literature is the discussion of traditional seasons. Perhaps you have wondered why, if the solstice in June is the beginning of summer, midsummer’s eve is a little earlier in June, the middle of the season illogically preceding its beginning. Contemporary climate changes are affecting the literary seasons, as discussed in an article in The Telegraph. At the end of the article, a list of natural phenomena associated with spring shows a common poetic interest with Japanese culture. The point finally is that the boundaries of the seasons — when they begin and end — are human constructs, depending on climate and culture. The English Department began developing ideas for a writing center in the 1990s. Dr. Elizabeth Cummins and Dr. Larry Vonalt were important forces behind the department’s request for a Center for Writing Technologies. Their project was finally realized in the establishment of the Writing Across the Curriculum Program, which includes the Dr. Beverley Moeller Writing Studio and the Center for Writing Technologies. While administratively separate from the Department of English and Technical Communication, the Writing Center and the department are close allies, especially concerning the Center for Writing Technologies (usually called "The Writing Center"). This summer, the department arrived at a plan to share licensing fees for new and upgraded hardware and software. I’m sure you are aware of the rate of change of software and hardware. To best serve our students, especially majors in Technical Communication, we need the best equipment and software available. The Writing Center was updated this August. In the future, this lab will accommodate such courses as Web-Based Communication and Multimedia Development and Design. In TCH COM classes this semester, students are authoring help systems with RoboHelp and creating books with FrameMaker; next semester, they will be conducting usability tests and creating tutorials with Camtasia. The lab has extended hours this semester (6-9 M-Th and 12-9 on Sundays) and hired a lab monitor to help patrons. Saturdays. The library also purchased a collection of Adobe classroom-in-a-book tutorials for the specific versions of Adobe programs we have and other tutorials for RoboHelp, Camtasia, and so on. Do you feel overwhelmed when you have to do research and presents the results in a written or oral report? Writing is an essential skill for professionals in almost any field. Speaking to people, in groups large or small, is also an important skill for professionals. Most of our department’s writing courses include a presentation, usually toward the end of the semester, on a topic that the student writes about and makes the topic of a presentation. In this year’s summer school session, Dr. Kris Swenson’s English 60 class explored representations of World War II. In the photograph, Andrew Jones begins his presentation on the importance of the US Air Force in winning that war. English 60  Writing and Research  builds on skills the student developed in Freshman Composition to develop substantial reports both written and oral. 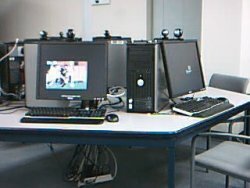 With networked computers and projectors in each classroom, students have ready access to technology such as PowerPoint to support their presentations. We’ve come a long way from overhead transparencies and flip charts. This may be the last summer school entry for this year. Students in writing classes benefit from the concentration of summer school; working each day instead of every other day make for better continuity and focus. 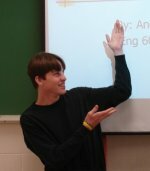 The photo shows Dr. Trent Watts, Assistant Professor of English and Technical Communication, making a point in his summer school class. In this particular session, the class was discussing Nathaniel Hawthorne‘s short story, "The Minister’s Black Veil." "In summer school students typically take one or two courses rather than the four or five they take during the fall and spring semesters. This more relaxed pace gives professors and students a chance really to concentrate on classes within the major or to explore a new subject. The classes are typically small and the campus offers few distractions from academic work. " "This literature is timely and relevant because it shows Americans wrestling with the very same questions that animate us today: what does it mean to be an American? how can we make a nation from such diverse peoples? what is the best way to build a government that protects liberties and provides order? what is our connection to and responsibility for the natural world around us?" Henry David Thoreau, Ralph Waldo Emerson, Herman Melville, and Emily Dickinson. Technical Writing (English 160) is one of our most offered courses, given every semester and in summer school for decades. Why is this course so consistent in its appeal to students? Because most UMR students know they will need to write reports and do presentations once they have their degrees and are working as professionals. 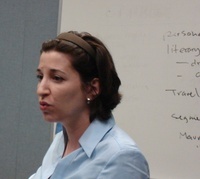 The photograph shows Dr. Kathryn Northcut as she begins a session of the technical writing course she’s teaching this summer. Summer school is its own special thing. I’m writing this entry the day before the 4th of July, one of the events that make summer school so special. Another is the unrelenting pace of classes meeting day-after-day. The compression and intensity of summer school can provide enjoyment: classes meet from 8:00 until early afternoon. Students and teachers can focus their work more effectively, at least in writing classes, and explore the subject matter in depth in 60 minute sessions that meet five days a week. In the summer, there are about 20% of the students on campus as in the regular semesters. The university sponsors a variety of camps and other events for students K-12, so there is a variety of people and activities that one doesn’t usually see in during regular semesters. The weatherwhen it’s not pouring rain or scorching hotinvites outdoor activities, relaxes students and teachers, invites sitting and talking, reading in the shade, perhaps even snoozing in a quiet place. None of these pleasures, though, negates the daily flow of classes, assignments, or reports due. When class is finished for the day, one has a sense of space, of openness, freedom . . . until one (whether teacher or student) remembers the next day’s assignment.